On May 12, 2008, a devastating earthquake rocked Sichuan Province of China, causing hundreds of thousands of casualties. 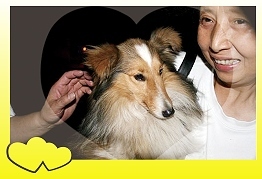 Amidst all the bad news, spread a heart-warming story in the disaster area about how two angelic dogs saved an elder. On the eighth day after the earthquake, the Chengdu Air Force Command Headquarters received a report from a monk from Fo Ying Temple, claiming that he heard continuous barking of dogs, which could indicate that someone was in need of help. A rescue team was immediately sent to investigate and they indeed heard the dogs barking. Following the sound, they found Madam Wang You-qiong trapped between two huge rocks. Although sixty years old and in extreme fatigue, Madam Wang was still conscious. The biggest mystery was: how did she manage to survive eight days after the earthquake? On the way to the hospital, Madam Wang narrated her story and answered the rescuers’ questions. During the period that she was trapped by the huge rocks, two small yellow dogs came to her and brought her food they had gathered from somewhere. They pushed the food through the narrow cracks for her to eat. When she was thirsty, the two dogs would lick her lips and face to keep her moist and conscious. When she was afraid, the dogs would bark and lean on her body to reassure her. It was the help and reassurance from these two dogs that kept Madam Wang alive, and it was also due to their barking that the rescuers managed to find out where she was. Until she was rescued, the two dogs kept watching on the spot and only left quietly after they saw that Madam Wang was in safety and conveyed to the hospital. At the same time, a Search and Rescue Team for Little Animals was established by the Home of Love, an animal friendly group formed by Chengdu citizens assisted by members of the Society for the Prevention of Cruelty to Animals (Hong Kong). They ventured deep into the disaster area to rescue animal friends that needed help. Another important mission that they had undertaken was to look for these two heroic dogs. Miraculously, they met a monk just in time to receive news about the two angelic dogs. The monk was the abbot of the Fo Ying Temple that had already collapsed and he told the rescue team that the two dogs were named Little Dear and Qianjin and were raised by him. Little Dear was a beautiful one-year-old female shepherd dog while Qianjin was a shy two-year-old male local dog. At that time, the dogs were being accommodated in another place nearby. To ensure that the dogs would receive the best care, the Home of Love decided to adopt them. Now, Little Dear and Qianjin are living happily under the loving care of the volunteer workers. This good news has also brought great joy to many people who were concerned about them. On June 8, carrying Master’s love and blessing, members from The Supreme Master Ching Hai International Association visited the Home of Love—Little Animal Rescue Center situated in Shuang Liu County, Chengdu, Sichuan. This is a non-profit NGO, founded by two compassionate ladies, Ms. Chen Yun-lian and Ms. Wang Xiao-hong, devoted to rendering care and love to little animals that need help. 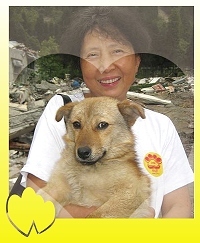 In the last eleven years, Ms. Chen spent all her wealth saving thousands of stray cats and dogs. After the recent Sichuan earthquake, Ms. Chen, braving all kinds of difficulties and oblivious of the hazardous journey and personal safety, led a team going deep into the affected area and rescued more than a hundred cats and dogs that had lost their homes. This compassionate action of saving animals in a major disaster was unprecedented in Chinese disaster relief history. Among the rescued animal friends were Little Dear and Qianjin, heroes who saved a human life. Ms. Chen had spent enormous effort before successfully rescuing and adopting them.